A global developer and manufacturer of coding and marking products, headquartered in the UK, is celebrating the official opening of its new fluids facility in Bootle. Domino Printing Sciences has moved its fluids manufacturing to a new 172,000 sq ft (16,000 sq m) state-of-the-art factory on the Senate Business Park, enabling a significant increase in productivity and capacity, as well as reduced lead times through investment in leading-edge production processes. The expansion will also result in the creation of 19 new jobs over the next nine months, bringing the total workforce to 88. Nigel Bond, Domino CEO said: “This new facility, located less than a mile from our previous factory, will accommodate the expansion of our fluids manufacturing capacity in line with growing demand, including a wider range of products and greater volumes. Not only will this meet our customers’ rapidly changing requirements, but also enable them to be even more responsive and competitive within their own marketplaces. At the Opening event, guests included Steve Rotheram, Metro Mayor of the Liverpool region, Koide-san on behalf of Brother and Marion Atkinson, Sefton Council’s Labour Cabinet Member Regeneration and Skills, together with representatives from Sefton Council, Liverpool City Region LEP and Liverpool Chamber of Commerce. The ribbon-cutting ceremony was carried out by Domino employees Martin Hiddleston, Christine Linden and Dave McMahon, followed by site tours. The new facility is five times larger than the previous factory and is arranged on three floors. It includes the manufacturing area, Quality Assurance labs, dedicated customer training and seminar facilities, administration offices and conference facilities, as well as ten-metre high warehousing space. From here products are shipped directly to major customers, sales channels and more than 200 distributors worldwide. State-of-the-art technology with in-line mixing capability and innovative materials handling processes, automated filling lines and robotic automated handling and palletisation systems will increase productivity and capacity, enabling faster lead-times. Cllr Ian Maher, Leader of Sefton Council, said: “We are delighted to watch Domino go from strength to strength as they expand its operation within Sefton, investing in the borough’s economy and creating new job opportunities. Dave Jenkinson, Fluid Operations Director said: “This is an important milestone for Domino and everyone who has worked so hard to bring this new facility to fruition. Two years ago we held a ground-breaking ceremony to mark the start of construction and here we are today, seeing a state-of-the-art factory that is fully operational. In welcoming the guests, Nigel Bond, Domino CEO said: “I’m delighted to be here this morning to open our new production facility which is a further major investment for our company, following on from the recent opening of a new factory in Shanghai serving the local market in China and the expansion of our HQ buildings in Cambridge. These collective investments demonstrate our confidence in the business, the robustness of the markets we serve and our ambition to grow our market share and provide our customers with the highest service levels possible. “Domino has had a long association with Liverpool, establishing our primary ink and consumables factory in the local area back in 1984. Our employees in Liverpool have done a wonderful job since that time, so it was never in question where we would build this new facility; the only question was could we find the right site within a radius from our existing buildings, to keep all the skills and the team together. Sustainability credentials for the new facility include photovoltaic cells on the roof to generate power from solar sources, and drainage of all rainwater and surface water into attenuation ponds on site for natural drainage or evaporation. Domino recently celebrated its 40th anniversary with a special event to recognise staff contributions to its success, held at its Cambridge headquarters. Staff in Liverpool will hold their own celebratory event with a Family Day in August. Sefton Council has revealed plans to help migrant schoolchildren get a better start at early years education. In May the local authority announced that it was successful in securing a £244,000 grant to help Sefton schools increase their already impressive levels of educational support to migrant children who come to live in the area. Work has already begun on a two year English Language Support project which will be rolled out to primary schools across the borough. As part of the project, migrant schoolchildren who are learning English as an additional language will now have access to weekly support sessions, while their families will receive access to linguistic lending libraries. Teachers and support staff in primary schools across Sefton are also undergoing additional training to help them further improve their skills to support new migrant children who move to the borough. Cllr Trish Hardy, Sefton Council’s Cabinet Member for Communities and Housing, said: “The legacy of this amazing project will leave schools across Sefton with specially trained staff, a sustainable English Language network and a bank of key resources for staff to build upon in years to come. “Not only will this project help support migrant children in learning English, but it will also foster an inclusive ethos which our schools pride themselves in, welcoming everyone as equal, valued members of the community. “Sefton has a proven track record of being an incredibly welcoming borough for all and this project will further our efforts in making sure children from all backgrounds have the best start in life, learning equally with their friends and peers. For more information about Sefton schools and learning opportunities, visit www.sefton.gov.uk/schools-learning. The Council would like to notify residents and others that Maghull Town Council and Lydiate Parish Council have each submitted a Neighbourhood Plan proposal. The Neighbourhood Plans set out a shared vision for the Maghull and Lydiate areas establishing the type of development needed to sustain each community. The plans will each be examined by an independent planning examiner and separate local referendum will be held in both Maghull and Lydiate parishes before they can be adopted. If adopted each Neighbourhood Plan will help guide development proposals within Maghull or Lydiate. All comments must be received by the Council no later than noon, Monday July 30, 2018. All comments received will be forwarded to the examiner and published on the Council’s website. Please indicate if you wish to be notified of Sefton Council’s decision to adopt either neighbourhood plan. The personal data you provide will be only used as part of the Council’s statutory planning duties. Information supplied may be published and made available for others to see and copy. Residents and visitors to Sefton are being encouraged to have their say on the borough’s highway network. 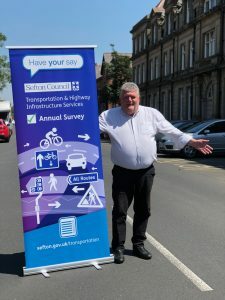 Each year Sefton Council conducts a detailed survey to find out what residents, commuters and visitors alike think of the highways around the borough. Launched in June and running until September 28, the survey seeks feedback on a range of services provided, including road defects, street lights, pavements, traffic management, cycling facilities and road safety. The results of the survey are then published on Sefton Council’s website, and the data captured helps to inform service planning and prioritisation in the coming months and years. Cllr John Fairclough, Sefton Council’s Cabinet Member for Locality Services, said: “Our highway network is the largest asset that Sefton Council is responsible for. “It is important that it works for everyone who lives, works and has fun in our borough. “Last year’s survey proved popular with a great deal of engagement – our highways are clearly something local residents feel are very important. England’s directly-elected regional mayors will meet in Liverpool today, at the invitation of Steve Rotheram, Liverpool City Region Metro Mayor. The meeting builds on the success of two previous meetings in London and Birmingham. At the summit, all eight mayors – four Conservative and four Labour – will call on the government for greater devolution of powers and funding over skills. All eight have signed up to a joint statement calling for further reforms to the skills system, including more control over Apprenticeship Levy funds to boost skills in their areas. Present at the meeting will be Tim Bowles, West of England; Andy Burnham, Greater Manchester; Sadiq Khan, London; Ben Houchen, Tees Valley; Steve Rotheram, Liverpool City Region; Andy Street, West Midlands. James Palmer, Peterborough and Cambridgeshire, and Dan Jarvis, Sheffield City Region, are unable to attend but signed the joint statement. All of the mayors present will attend the International Festival of Business, currently taking place in Liverpool, and supported by the Liverpool City Region Combined Authority. The morning will see a panel discussion featuring a number of the mayors, while Sadiq Khan will address the Festival in the afternoon, followed by an “in conversation” session with Steve Rotheram. A focus for discussions will be the Government’s flagship Apprenticeship Levy, which is intended to fund new apprenticeships through a levy of 0.5% of their paybill for employers with salary costs of more than £3 million per year. Funding can then be drawn down by employers to pay for apprenticeships. Since the levy was introduced new apprenticeship starts have dropped by 24%, and businesses are finding it difficult to provide the apprenticeships our regions need. The metro mayors agreed the following joint statement: “As the UK approaches Brexit it is of vital importance for our future growth and prosperity that businesses have access to a workforce with the range of skills necessary to be competitive in the modern global economy. “As Mayors representing every corner of England we know we would be letting our residents down if we failed to provide them with the opportunities to gain the skills and experience they need to fulfil their potential. “Between the eight of us we account for nearly 42 per cent of all British growth (GVA). We know our local economies and the needs of the labour market in our areas and we are committed to developing innovative ideas to create a step change in skills and training provision. “We recognise the Government’s efforts to reform the skills system and applaud its ambition to see three million apprenticeships by 2020. However, the reality is that the number of apprenticeship starts has dropped sharply, with the number of starts falling by 24% since the introduction of the Apprenticeship Levy last year. “With that in mind, we call on the Government to give us the flexibility we need to address these issues, specifically by granting city regions control of the Apprenticeship Levy funding which levy payers do not spend, and by further devolving control of 16-19 skills policy. “We also call on the Government to provide additional funding for us to ensure that there are enough quality providers in our city regions, and to drive the quality of apprenticeships. “If Government allow us these flexibilities and worked with our city regions, we would ensure that it is used to deliver the gold-standard apprenticeships and skills training that our residents, employers, and the country as a whole, so desperately need.